Drugstore beetles are a small insect about 1/10th to 1/4 of an inch long and brown in color. Adults can fly and are attracted to light. They’re oval in shape and closely resemble a cigarette beetle. However, there are two differences which a trained eye will note: the antennae have a distinct three segmented club structure compared to the cigarette beetles serrated antenna and the wings of the drugstore beetle have deep grooves or pits where the cigarette beetle has none. 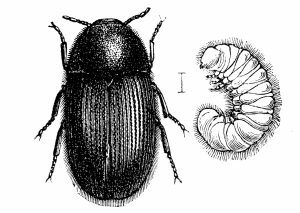 Though both beetles will infest many of the same foods, drugstore beetles can and will eat from a much larger list of “food”. If you have drugstore beetles in your home, you will have to do several things to both remove the active infestation and stop their eggs from completing their life cycle which would effectively cause a re-infestation. Drugstore beetles are found throughout most of the world. Though their name implies they may be a problem for pharmacies, homes are the most common structure they invade. Drugstore beetles hatch from eggs which are generally laid on food stuff their larva like to eat. Once hatched, the larva will start to eat and will do so for 3-5 months. It was once thought they mainly liked flour because they are such a common pest found in bread. However, careful research during the twentieth century taught us that drugstore beetles can live on just about anything found in the home. The list includes flour but also has anything meal based such as any common breakfast food as well as condiments, spices, coffee, any type of bean, rodenticide and other poison baits used for rodents, books, fabric, wood, furniture and wall paper. Their diet has been found to be so large that one entomologist was heard saying “they will eat anything except cast iron”. Once drugstore beetle eggs have fed enough to derive the nutrition they need to become adults, they’ll spin a cocoon and undergo metamorphosis. This will take 2-4 weeks and once complete the adult will emerge to mate and lay eggs. Since adults fly they will look for adequate food on which to lay eggs in case prime food stuff has been removed. It is for this reason alone that controlling drugstore beetles can be a tiresome task. Most drugstore beetle life cycles take 6 months to complete but in warm climates like the south, three cycles can be completed in one year. 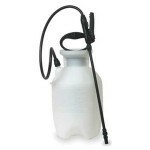 In order to break the cycle once and for all, you will have to do three key things: 1) Remove or treat any contaminated food or other items where larva or adults have been found 2) Treat such areas to insure hatching larva are not able to survive by eating something other than the contaminated food stuff found and 3) Set out Pheromone traps to catch reproduction minded adults before they are able to mate and lay eggs in some other part of the home. The first part of getting this pest under control is the need to identify the central food or item they’re eating. Most adults will emerge from cocoons which are located very close to where larva fed. If you are finding adults in the pantry then you most likely have some type of cereal, spice, flour, cookie, grain, bean or some other item with active larva and/or adults. The best approach is to initially remove everything from the cabinets where activity has been noted. The good news in this case is that the infestation may be limited to just these items. As you remove boxes and containers, be sure to inspect them carefully for white grub like larva, adults and empty cocoons (empty cocoons is a sign of hatching adults). Anything suspect should be thrown out; boxes which you don’t want to throw away can be stored in a plastic bag to see if adults emerge. In 2-3 weeks after being bagged, if you find adults in the bag, you’ll know its contaminated and should be discarded. If the problem is isolated to the kitchen or pantry, use FS MP AEROSOL. This fast working oil based aerosol will quickly kill all activity and penetrate all cracks and crevices where eggs might lodge and adults might use to roost. One thorough application will knock out all stages and can solve the problem when the main nest site is known and the activity has been limited to a small area. One can will cover the average kitchen and pantry 2-3 times so it should be enough to solve most small problems. Plan on doing one thorough treatment but if more adults come back within 2 weeks, treat again. And if you have them throughout the home, you’ll be better served using the next aerosol option listed below. Since drugstore beetles can fly and if given the chance can migrate to other parts of the home, you might be better served with the non repelling PHANTOM AEROSOL. This product does not kill quickly. 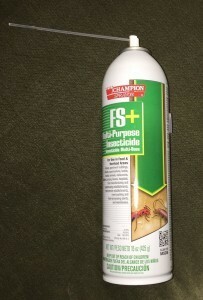 In fact it will take 2-3 days to kill any affected insect. But during this time it can easily be transmitted to others so when it does eventually kick in and start to kill, many can be controlled even though just a few touched a treated surface. Like the FS MP, one can of Phantom will go a long way and should be enough to treat the average kitchen and pantry several times. And since it won’t spook or chase beetles, its well suited for treating any room with activity. Do this by spraying baseboards, molding, etc. where beetles might be hiding. 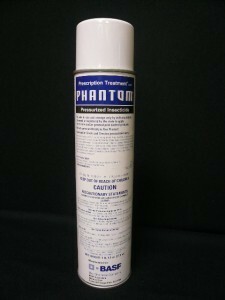 Phantom may not kill quickly but it will prove helpful when dealing with problem where the source is unknown. Like the FS MP, you should treat every two weeks until all activity ceases. 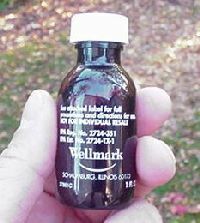 If drugstore beetles are being found throughout the home, there is a good chance they’re taking advantage of something else other than traditional “food”. When this happens, you’ll need to broaden your treatment zone to include furniture, fabric, carpet, books or other inanimate objects. For this task, you’ll need a good adulticide and growth regulator. Working together, these two actives can solve persistent problems and are especially helpful when the problem is active in many areas of the home. Labeled for treating open areas like furniture, carpeting, baseboards and more, DEFENSE SC is odorless and treatments will last 30 days providing good residual. Overall it will be more cost effective to use when treating many rooms or the entire home. Mix 1/2 to 1 oz of DFense per gallon of water and use the mixed solution to cover up to 800-1000 sq/ft and should be renewed every two weeks when beetles are active until all activity ceases. You will need a good PUMP SPRAYER to apply the DFense and this one will give you a good fan pattern for wide and uniform coverage. When treating, be sure to cover furniture, bedding, carpets and just about anyplace these beetles have been seen or found. Defense is unique in that its both odorless and non-staining. It too is encapsulated so you will only have to apply it every 2 months once the problem is under control but use it monthly when first treating. For extra protection, add GENTROL EC to the tank mix. This material is what we call a juvenile growth hormone. It won’t kill active adults affect pupae. But it will effectively stump larvae from growing into adults. And since one application can last 3-6 months, it can help prevent having to retreat with the DFense every 1-2 months when Dfense is used by itself. Gentrol is also very much like Phantom in that it won’t be noticed by foraging beetles. And it trans-locates. So if you spray the baseboards in one room with a mixture of Dfense and Gentrol, the Gentrol will effectively move up the wall and cover a much larger area thus ensuring some beetles will cross over it. Add 1 oz of Gentrol per gallon of mixed Dfense (and yes, the two should be mixed together, in the same sprayer, and applied at the same time). You don’t have to keep adding Gentrol every two weeks like you might with the Dfense but using it that frequently is okay if you want to keep applying it. But in general, one application of the Gentrol will last 2 months. Now that you’ve removed contaminated food and/or treated inanimate objects on which the larva or eggs might be hiding, you need to complete the treatment process by installing traps. DRUGSTORE BEETLE TRAPS rely on strong pheromones to attract adults to the protected cavern which contains a sticky glue. 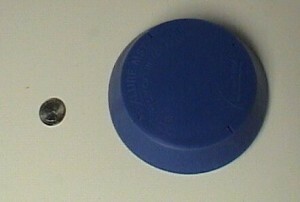 Once they enter, the glue will capture and hold foraging adults. This is important; by capturing adults you will prevent them from mating and laying eggs. This first trap will target nothing but adults and will be active for up to 4 months. After then, discard if all activity has ceased; replace them if there is reason to suspect there might be a recurring problem. Now if you’ve seen a lot of foraging young, get the combo model known as the XLURE TRAP. 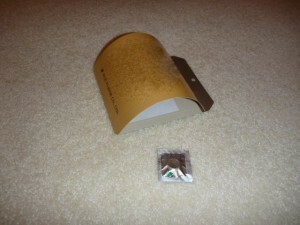 This trap combines a pheromone and a food lure so it will attract all stages. Traps should be placed in all rooms where activity has been noticed and replaced every 4 months in homes with ongoing problems. Though kitchen, pantry and cabinets may be the main areas one thinks of for trap placement, be sure to inspect any window in the home. Remember, drugstore beetles are attracted to light and will tend to accumulate on window sills. If this is happening, locate traps by these windows. Next, be sure to inspect the traps once a week to insure they don’t fill up and stop catching beetles. And if they do fill, change them out immediately. Keeping a fresh set up of traps is imperative if you want to catch all potential reproducing adults and end the cycle. Drugstore beetles are a pest which can be tough to control because they fly. If you’ve found some in your home, you’ll have to find the main food supply and remove or treat it using the PT-Microcare and/or DFense. If you have adults flying around the home every day, use some Microcare to fog air spaces insuring flying adults will not be able to relocate and start a new population. Lastly, be sure to set out drugstore beetle traps in all rooms with activity so reproducing adults can be intercepted and captured before they start laying eggs on books, fabric or furniture in an attempt to get colonized in new parts of the home. Very helpful and hopeful. I’d rather phone in to order and control drug store beetles. The local pro was not too certain about what he could do. The traps were not mentioned. Thanks. Give us a call anytime if you need more help or to place an order. Our toll free is 1-800-877-7290 and we’re open 8:00 AM to 7:00 PM Mon-Thur; 8:30 AM to 5:00 PM Friday and 9:00 AM to 1:00 PM Saturday, Eastern Standard Time. With the right products applied in the right areas, you can definitely control this pest.